Assam is situted in North Eastern part of India with natural beauty, this mesmerizing state is blessed with beautiful hils, forest, valleys and the mighty river Brahmaputra.Assamese people are very simple to get to know and their cuisine is also as simple as much and very easy to cook.As like the neighbourhood states, Rice is the main ingredient of Assamese cuisine, rice is a part of their traditional breakfast and all the other dishes are prepared revolving around it. Authentic Assamese cuisine is excellent for health as it uses very small amount of oil,ghee or spices though this cuisine is somewhat rustic and blend. For my today's post for Assam state of my long blogging marathon, am posting is this simple, delicious sweet with rice, chopped dates, jaggery and cashew.Initially i want to make their Aloo pitika, a mashed potatoes recipe which is quite a favourite item among the Assamese, as the potato are the most popular vegetable of Assam. While going through google, this Gooror Payash caught my attention from Sunita's Space. I prepared this delicious sweet pudding few days back for our lunch and we loved it. With simple ingredients, this gooror payash tastes absolutely fantabulous, usually this payash is served thick as much as like South Indian sweet pongal, but i loved mine as semi thick and i just enjoyed it thoroughly. Heat the milk in a heavy bottomed pan over high flame. Reduce the heat and simmer the milk for 10 minutes. Add the rice along with bay leaves and grated jaggery to the milk. Cook everything in simmer, stir continously to avoid sticking to the bottom of the pn. Once the rice is half cooked, add the chopped cashewnuts, chopped dates and cook everything well until the rice gets cooked well, take care to stir constantly. Remove from heat remove the bay leaves. The rice pudding appears in so many cuisines, right? Love this with the dates! This reminds me of rice pudding. I like idea of adding jaggery and dates. Makes it more wholesome. Sounds like rice kheer n luks delicious...Nice pic. I love rice puddings and trying out new versions too. I'm deeply intrigued by the use of bay leaves in your recipe. I've got to find out what that tastes like! 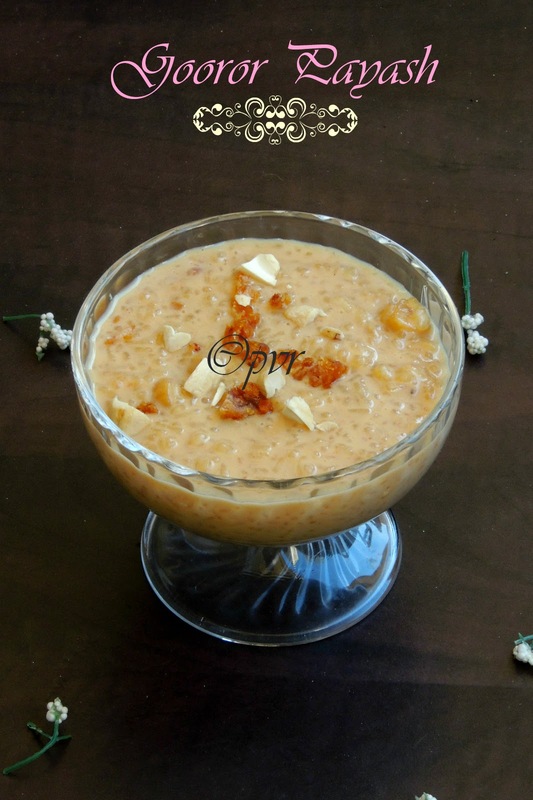 Every state has a different way of cooking kheer..this one looks nice with the addition of dates.Bookmarking. sound like arisi payasam. Looks creamy and delicious. Tempting and delicious to look at payesh. delicious payasam...Adding bay leaves to sweet dish sound new to me..
very healthy and yummy payesh. Love the flavors going into it.. Delicious and inviting dessert..
Looks so tempting and awesome.. Divine!! bayleaves in a sweet dish... never heard before... this sounds easy and yum..
Yummy Dessert. Oh god this BM team is coming up with new recipes which we donot know. So good to know about Indian recipes. Super tempting kheer,looks so fabulous..feel like grabbing it..
A lovely rice dessert, Priya. as u have said - looks so much like our Sakkara pongal, so tempting and delicious.. but bay leaf is interesting in there!! Kheer looks very delicious Priya. Bay leaves in payasam very new priya!!! looks very inviting and very tempting payesh! that's a lovely dessert ...adding bay leaf is new to me...looks so tempting. Looks so delicious, wish I could have a bowl now..
That is one yummy looking rice pudding. Kheer looks so rich and yummy ! Such a rich and lovely dessert, looks very tempting Priya. I don't remembe rth elast time i had any kind sof payasom, this looks so good. The dates must have added a very different flavor to the dish. It looks delicious. Wow this looks so beautiful. I always thought milk and dates do not go together. and Bay leaf. This is awesome Priya. I like this payasam, but do make the aloo pitika when you get time. Its excellent! I can imagine how delicious the kheer must have tasted. Payash looks divine! I am sure it tasted awesome. I am making this now but the milk seems a bit curdled. Is that normal? This is my second batch as I threw the first batch out when I saw it curdling.but even with fresh milk, the same has happened. Is it the bay leaf that does this? Has anyone else cooked this? @Preeti Sinsunwal it may because of the jaggery you are using, once the rice gets well cooked, put off the stove and add the jaggery. Stir until its gets well mixed. Hope this helps.